Mission Impossible: Fallout is a sequel of sorts to the previous Mission Impossible movie (Rogue Nation) and plays out like a hyper-budgeted James Bond film – no wonder this film series – fronted by Tom Cruise – keeps going. 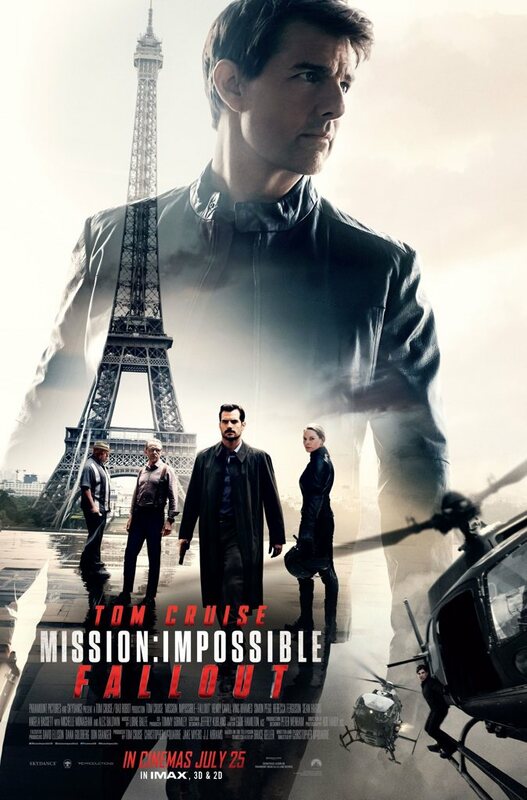 This time, the Mission Impossible team are chasing across the world to prevent an anarchist’s terror plans with a nuclear weapon and some characters from Ethan Hunt’s past get involved. There’s plenty of well crafted set pieces of varying size as the action moves from Paris to London and then out to Kashmir for a finale in the foothills but the spectacle seems almost from another age as cgi is less obvious or minimised making this almost a throwback to action films of old. This is a celebration of the very best of practical stunt work mixed in with the classic Mission Impossible sensibilities – rubber masks, meticulous planning, double crosses, and some emotional scenes as Ethan Hunt – played brilliantly again by Tom Cruise – goes out of his way to keep the body count of innocent bystanders at a minimum. The Paris scenes were reminiscent of previous action films like Ronin and Inception – with some scenes in particular being reminiscent of Christopher Nolan’s work – it’s well known that the British director would be very interested in helming his own Bond movie. Bond movies have come a long way in terms of action since Daniel Craig’s tenure started in 2006 but the Mission Impossible series has worked hard to earn the crown of action set piece king – and it’s no surprise that recent Bonds – having steered more towards drama – pale in comparison to some of the stunts on show here even in familiar locations. London has a different kind of action set piece with much of it taking place in imaginative and little used locales in the city, but no less exciting and it’s here that some of the series humour shines in and amongst the action while the plot guns along at a decent pace. Mission Impossible – bigger and better – but also over? As mentioned before, this is a continuation of sorts from the previous Mission Impossible film – Rogue Nation – and people who have seen that film (and earlier ones in the series) may appreciate some of the more emotional moments more. Cruise does many of his own stunts as usual, including famously one sequence in London when he injured himself and temporarily shut down production for a time, and it’s his willingness to put himself on the line for some breathtaking action that helps keep the action exciting. The Mission Impossible series has been around for over 20 years and six instalments with the latest one showcasing the latest addition to the venerable film series in Henry Cavill as CIA rival August Walker. Cavill is a hulking presence next to the noticeably smaller Cruise’s Hunt and his rivalry with Cruise’s veteran spy contrasts their methods – Cavill being the bruiser especially in a thundering sequence in a Paris bathrooms while Hunt remains a tenacious and agile fighter. It’s a long film, giving room for characterisation with the supporting cast including plenty of returning characters from previous films plus a solid turn by Vanessa Kirby as an arms dealer and enough story telling to give the plot some good texture. At 56, Cruise is two years younger than Roger Moore was when he retired from the role of James Bond following A View to a Kill in 1985 and given the time between these tentpole films it’s quite possible that this could be the final Mission Impossible film. Moore was until recently the longest serving Bond and remains the oldest to have played the role but Cruise’s tenure as Hunt overshadows all the Bonds at 22 years and counting. Regardless of the thrills to be found in the Mission Impossible series, Cruise is starting to look a little long in the tooth. I find myself missing the good dramatic films he used to be in but this is certainly a better effort than The Mummy (2017), and while Bond can ‘regenerate’ into a different actor it’s hard to see how the series can continue without its star. Summary: MISSION IMPOSSIBLE: FALLOUT is an action thriller in which the Impossible Missions Force must race against time to foil a terrorist group’s plans for a nuclear catastrophe. This entry was posted in Shooting The Breeze and tagged Mission Impossible: Fallout, Tom Cruise. Bookmark the permalink.